So this is it – Day 30!! I made it! I didn’t start out with this challenge thinking I wasn’t going to be able to post every day for a month. I usually write every day. But I was hitting this lump that I seem to get in late January-early February every year where I have run out of interesting things to say. So I’m glad that I did this – it boosted my ideas and helped me get back into a narrative voice. Today’s prompt is to write about one thing I’m excited about. I’m excited this challenge is over and I can start writing about other things in my life. I have a whole list on my phone that I’ve been saving because I didn’t want to be posting more than once or twice every day during this challenge. Obviously, that didn’t always happen but I tried to control myself. I’m excited for my upcoming series on people who I find inspiring, and who will hopefully offer some inspiration to others who are reading the posts. If you’re new and want to check that out, click here. I’m excited to move again! For those of you who have my address, don’t worry it’s staying the same. I’m just moving from one room in the house to a different one, but this is my 4th move since last November. BUT it means I’ll be in my own little apartment suite instead of just a bedroom. Hello, private kitchen with a working oven!! Think of all the baking I can do now. I’m excited for the A to Z challenge. I don’t have a theme yet, maybe I won’t have one this year? But I’m excited nonetheless. I’m excited for 4th to be planning my non-existent wedding. It’s happening May 27th, 2019 (yes that is a Monday, she doesn’t care). I was supposed to be engaged by this Valentine’s Day so I’m going to get a lecture from her but it’s ok. She says there’s still time to find true love. It’s putting a lot of pressure on Valentine’s Day this year – maybe that’s why I’m feeling like I’m missing out this year by being single? Meh, who knows! I’m excited to exchange this writing challenge for a fitness one. I am going to attempt the “100 squats a day for 30 days” thing. I can totally not do it. But it’ll be fun to try and then hate myself for thinking I could do it. It’ll be like pilates all over again. I miss pilates. I’m excited to make my Valentine’s Day treat for my kidlets! It means I have to make one for everyone in the two houses, so 22 cupcakes in total, but I gots this. I’ll post pictures and possibly a video when I’ve completed it. 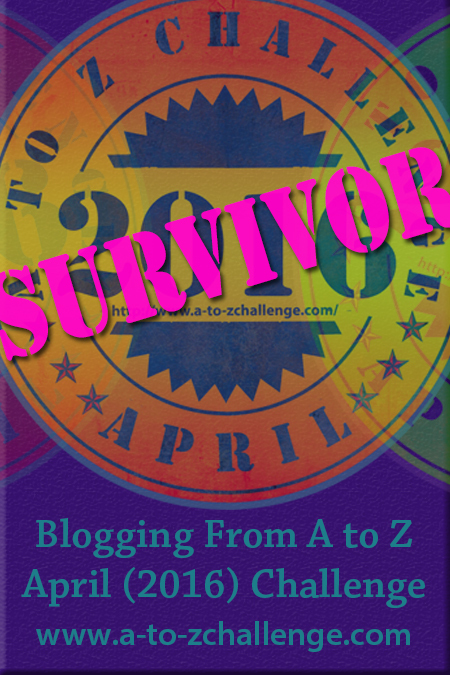 I’m excited to get to know some new bloggers – both through this site and the A to Z Challenge. Just a little sidenote: if you know any great blogs that you think I should check out, lemme know in the comments below because I’m open to reading some new material. no…you don’t get 10 things. Why? Because 10 is too expected. Thanks for joining me on this writing challenge! I feel refreshed, a little bit at peace in my mind, and ready to take on more writing! !